The good news is that the union threatening to strike only represents half of the border workers. The bad news is that the other half won’t be able to get to work because the train drivers are striking too. David Cameron has condemned a planned strike by border staff that is threatening to disrupt travel arrangements for the Olympics. The prime minister said he hoped the strike would not go ahead but insisted the Olympics would be safe and secure regardless. Passport control. Photo by Steve Parker. 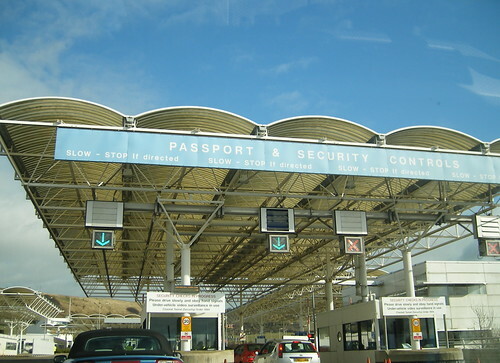 Border officials voted on Wednesday for industrial action, raising the spectre of strikes affecting passport queues at Heathrow during the busiest days of the Olympics. Members of the Public and Commercial Services (PCS) union agreed in principle to strike and other action, which could include an ongoing work-to-rule, in protest against their pay and working conditions being eroded and the privatisation of civil service jobs, and to highlight what they describe as a “public service falling apart at the seams”. The Border Force is already stretched, with supplementary staff enlisted to ensure there is no repeat of the reported three or four-hour waits that made embarrassing headlines internationally earlier this year. Emergency staff the Home Office drafted in took the place of striking officials during action in May and last November. But while those strikes did not lead to significant extra queues, the PCS claims that untrained replacements waved through many passport holders to avoid lines building up. And Theresa May, already under fire for the G4S Olympic security fiasco, where police and soldiers have had to step in for absent guards, will not wish to face further questions over security. The mandate for action comes after the PCS balloted almost 16,000 members representing the majority of Home Office employees in the Identity and Passport Service, the Criminal Records Bureau and the Border Agency. Around 5,500 PCS members are employed directly in the border operations, and others in the Home Office are supplementing the normal staff during the Games. The union will decide what action to take and must give seven days’ notice of a strike, which could mean pulling immigration officials off duty the day before the Olympic opening ceremony – a date forecast by Heathrow as the peak day for sponsors and international media to arrive. Last week the chief inspector of borders and immigration, John Vine, warned that temporary staff were processing passengers more slowly while asking fewer questions, and had received only basic training.